I am elated when I hear about heartening news such as this: Librarians rebel against pricey science journals, embrace open-access pubs like PLoS. Also, a brilliant, brilliant policy framework is the NIH’s current Public Access Policy, which ensures NIH-funded research is accessible to everyone in order to enable advancement of scientific knowledge and betterment of health. This past November, NIH had made a commitment to enforce this policy, which seems already to have borne fruit, according to a recent Nature News report. Jonathan Eisen (@phylogenomics on Twitter), an evolutionary biologist, microbiologist and genomics researcher, and a Professor at University of California at Davis, is the Academic Editor in Chief of PLoS Biology. He has been a long-time Open Access and Open Science advocate, and has earlier written on the inequities of Nature in scuttling the Open Access process. But Nature Publishing is most certainly not the only one to blame. 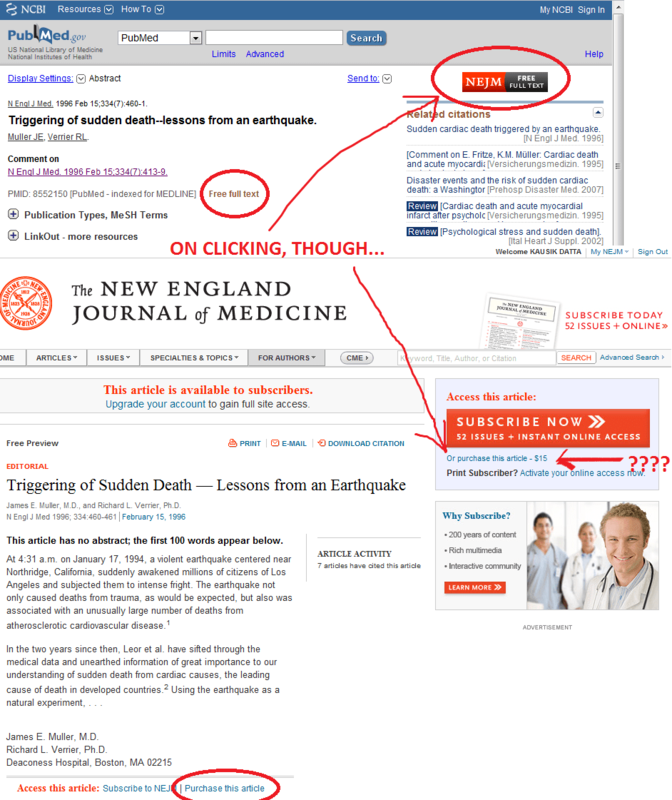 Imagine my surprise, then, when – upon clicking “NEJM Free Full Text” – I got to this! Does this make any sense whatsoever? Especially, for a 1996 comment on a 1996 article? Update 1: Prof. Eisen had alerted me on Twitter to the possibility of this being an IT error. So, I did the decent thing and sent in an email to their contact address. I stated, “This 1996 article (PMID: 8552142) and the comment on it (PMID: 8552150) are both listed on PubMed as “Free Full Text”. Yet, when I click the NEJM Full Text link on the top right corner, I get to a preview page which asks for subscription, or a fee of $15 for either article. Is this some kind of a mistake or website error, or am I really expected to pay $15 for a 1996 article or editorial comment on an article?” I had hoped they’d respond. Update 2: Umm… No. They didn’t. And today, before publishing this post, I checked that paper again. One consolation: now, instead of Free Full Text (as in the screenshot), it now says simply “NEJM Full Text” on PubMed – and the going rate is still… you guessed it, $15.